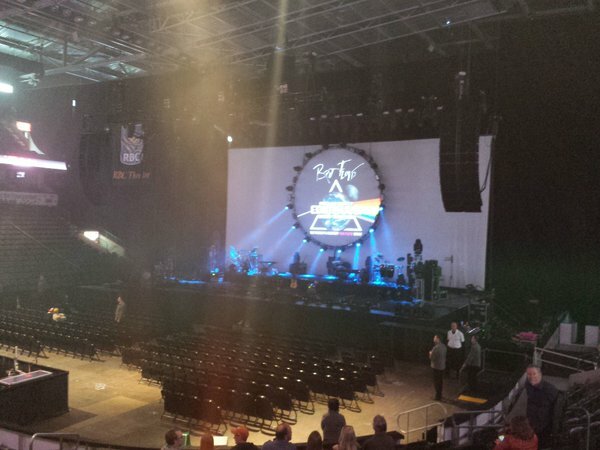 Once again I was given the privilege of representing Budweiser Gardens as their #BGReviewer for Monday night’s Brit Floyd concert in the RBC Theatre. For those who don’t know, Brit Floyd is one of the world’s most renowned Pink Floyd cover bands. Covering Pink Floyd tracks from the early 70s all the way up through 1994’s The Division Bell, Brit Floyd puts on a show worthy of the using the word ‘Floyd’. Like their inspiration, they make liberal use of lights, videos, and yes, lasers, to augment the music into an incredible multimedia experience. Brit Floyd is made up of six members along with three backing vocalists. While not on stage in front of the audience, their sound and video/lighting engineers also definitely are an important part of the band and should not be forgotten about. As a long time Pink Floyd fan, I had heard of Brit Floyd and had wanted to see them on previous stops in and around London. Various physical and logistical factors had always conspired against me. Besides, could they really stack up against having seen Pink Floyd in 1994 during their tour supporting The Division Bell? When the opportunity came up to attend the show and write a review for Budweiser Gardens there was no way I could refuse. Pretty much from the moment I stepped inside Budweiser Gardens, I knew that I was in for something unique. Banners other imagery were spread throughout leading the way to the merchandise table. Two things caught my eye about the merch table. One, the prices weren’t outrageous. A tour poster for $5? Even concert Ts weren’t the usual ridiculous prices. Two, there was a sign stating that the band would be gathering after the concert to sign autographs. That’s right – for free. Fantastic! We make our way to our seats and notice a giant videowall behind the stage with an all-too-familiar light ring in the center. At 8:00 the house lights go dark and the energy builds. Having looked at previous stops’ set lists I was expecting Signs of Life and was not disappointed. Building right into Learning to Fly, it was possible to close your eyes and you would be hard pressed to say that you weren’t actually listening to Pink Floyd. From there the band moved onto High Hopes then back in time to Shine On You Crazy Diamond (Parts I-V). The rest of the first set was a mix of tracks from Dark Side of the Moon, The Wall, and The Division Bell before finishing with Pigs (Three Different Ones) from 1977’s Animals. I was delighted to see, part way through the song, a giant inflatable pig appear off to the band’s right, complete with psychedelic glowing eyes! 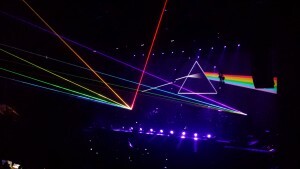 Of course going to any type of Pink Floyd-related show one expects a fantastic light show complete with lasers. Brit Floyd’s use of LED spot lights is nothing short of amazing.By introducing a slight fog into the arena they LEDs did a fantastic job of replicating lasers. Sure, the beams were a bit bigger but with a full colour spectrum it was easy to forget that there were no lasers. During the intermission I tweeted out a teaser of this review questioning if LEDs can replace lasers. At that point I was ready to say that while they looked fantastic and cut through the air like wider, fatter lasers, they weren’t a perfect replacement. The second set started off with a complete performance of Echoes from 1971’s Meddle. It’s something unique to see a band playa 23-minute song. Getting back to my LEDs versus lasers debate, I’m happy to report that the answer presented itself during the beginning of the second set. The answer is…LEDs don’t have to replace lasers; because they have lasers. Multicoloured beams of laser light, carefully aimed to not hit anyone in the audience, shot out from the stage at various points of the song, further improving what is the Brit Floyd experience. The set went on to play the best known tracks from The Wall, Dark Side of the Moon, and Meddle. Their cover of Great Gig in the Sky is truly beautiful. A standing ovation, the first of the evening, greeted the backing vocalist at the end of that track. After Money, the band took the time to introduce each member of the band, including all three backing vocalists. I’m not entirely sure but it seemed like Ola Bienkowska, the backing vocalist who performed Great Gig in the Sky received the most applause as well. They then went into the final song of the second, Comfortably Numb. After that, the stage lights went dark but the house lights stayed off. After a moment of darkness broken by applause and cheering from the audience, the band returned for a two-song encore. The first song was Wish You Were Here. It’s something special to be part of an entire arena singing along with the band. The final track of the night was The Wall’s Run Like Hell. They held nothing back for this song, the lasers and lights were frenetic and the band, after nearly 3 hours of performing still had the energy to pump out this track. After a final ovation, the band left the stage and the house lights came up. For this review I wanted to try to avoid comparing Brit Floyd to Pink Floyd as well as avoid comparing this show to the Pink Floyd concert I attended back in 1994. I realized it would be foolish to do so. While the experience is unique, ultimately the band wants to be known for providing the best Pink Floyd experience short of it actually being a Pink Floyd experience. And they do an incredible job at it. We were treated to an amazing show put on by a group of artists that are obviously in love with the source material. One thing is for certain, the next time Brit Floyd makes an appearance in the London area, I’ll be doing everything I can to make sure I’m there. Thank you again to Budwesier Gardens for providing the tickets in exchange for this review and thank you to Brit Floyd for loving the music and wanting to allow new generations to experience it live.